Located in the historic South End neighborhood of Portsmouth, NH, the Wentworth Lear Historic Houses overlook the back channel of the Piscataqua River. The museum consists of three structures that all date from the mid-18th century: the Wentworth-Gardner House, the Tobias Lear House, and the Warehouse. Both the Wentworth-Gardner and Tobias Lear houses are classic examples of Georgian architecture. Tours are given to the public from June 1st through October 12th. Built in 1760, the Wentworth-Gardner house is one of the finest examples of Georgian architecture in this country. The house was built as a wedding gift by Mark Hunking and Elizabeth Wentworth for their son, Thomas, and his bride, Anne Tasker. The Wentworth family was a powerful dynasty in colonial New Hampshire. Thomas’s uncle Benning Wentworth was the Royal Governor for the Province of New Hampshire from 1741–1766 and was succeeded by Thomas’s brother John Wentworth, who became the last Royal Governor in 1766. The Wentworth wealth is demonstrated in the heavy carving and exquisite detail of the formal parlor, parlor chamber, and traditional hallway, which extends the entire depth of the house. In 1793, Major William Gardner bought the house and moved in with his second wife, Elizabeth. Major Gardner lived in the house for forty years until his death at age 83; however, his third wife, Sarah Purcell Gardner, remained in the house until 1854. Later owners converted the mansion into a tenant house in the time when the waterfront neighborhood had become somewhat disreputable. Pubs and brothels clustered along Mechanic Street and the surrounding streets. In 1915 the house was purchased by Wallace Nutting, a photographer and antiquarian. He restored the home in the Colonial Revival manner and photographed models in almost all of the rooms. In 1918, during World War I, Nutting offered the house for sale, and it was purchased by the Metropolitan Museum of Art in New York City. The Met prized the house for its detailed carving and nearly perfect Georgian architecture. Plans were to move the house to New York. After the Stock Market crash of 1929, the Depression put to rest any ideas of relocating the house to New York City. The Society for the Preservation of New England Antiquities (now Historic New England) furnished the house and briefly operated it as a house museum. In 1940, the house was purchased by a group of preservation-minded local citizens who established the Wentworth-Gardner and Tobias Lear Houses Association, now known as Wentworth Lear Historic Houses. 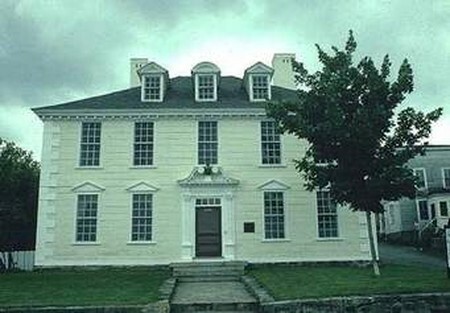 The Lear House was built circa 1740 and is an example of the Georgian architectural style. The house has a graceful hip-roof and is considered a mansion because of its size. The house is actually one of the most modest of Portsmouth’s historic house museums and gives tourists a view of how the middle to upper middle classes lived. The Lear House was built by Captain Tobias Lear III. He was the grandfather of Tobias Lear V, who became the private secretary to President George Washington. Tobias V was born in the house in 1762, was raised in the house, and returned, a beloved and successful son of Portsmouth, with President Washington in 1789. Washington visited Madame Lear, Tobias’ mother, in the front parlor while a crowd watched the audience from the street. The story is well documented and a celebrated piece of the city’s history. The house stayed in the Lear family until 1860. After this time, the house became a tenant house until it was purchased by Wallace Nutting in 1917. He then sold the property to Jessie Varrell, who in turn sold it to William Sumner Appleton of the Society for the Preservation of New England Antiquities (now Historic New England). Appleton sold the house to the newly-formed Wentworth-Gardner and Tobias Lear Houses Association in 1940. The house has been left largely intact although it was a tenant house for much of the late 19th century into the 20th century.